Craig Venter has been a prime mover in some of the most exciting developments in the relatively new science of genomics. Following a lackluster academic performance at high school, he emerged from the Vietnam War determined to make a difference to people’s lives. His scientific teams were the first to read the entire genome (genetic code) of a free-living organism and played a major role in building the first complete map of the human genome. Venter’s Global Ocean Sampling Expedition discovered more genes than had ever been documented before, and his team created the world’s first synthetic species of bacteria after they constructed an entirely new DNA molecule in the laboratory. He has been listed in publications such as Time and New Statesman as one of the most influential people in the world, and he was The Financial Times ‘Man of the Year’ in 2000. John Craig Venter was born in Salt Lake City, Utah, USA, on October 14, 1946. His father was John Venter, an ex-Marine turned accountant. His mother was Elizabeth Venter (née Wisdom) who sold real estate. Craig’s brother Gary was a year older than him, and he had two younger siblings, Susie and Keith. Craig grew up in Millbrae, a small town 15 miles south of San Francisco, California, where his father had become a partner in an accountancy firm and his mother had become a homemaker. Craig’s childhood was characterized by adrenaline and building things. He and his young friends raced their bicycles against passenger jets taking off from San Francisco Airport (these were pre-security fence days) and haunted the railroad tracks, jumping on and off moving freight cars. His adventures began getting out of hand when, in his first year at high school, he ended up in the back seat of a car stolen by his friends and chased by the police. Craig managed to run away and avoid capture. He decided in future to keep on the right side of the law. He built underground tunnels, soapbox racers, crystal radio sets, and forts. As he got older, his projects grew more sophisticated, including an eight-foot hydroplane and an electronic baseball scoreboard for his school. In September 1960, age 13, Craig enrolled at Mills High School, Millbrae. He did not enjoy school, and most of his teachers did not enjoy him being at school. He was inattentive in class, talked when his teachers were teaching, and spent a lot of time in detention. His grades were usually Cs and Ds. In more recent times, he would probably have been diagnosed with ADHD. His prospects improved in the summer of 1962, when a short-lived summer romance with a girl interested in literature and classical music changed Craig’s view of the world. He and his brother Gary joined the school swim team and, after a lot of dedicated training, their team set a new American record. Craig won individual gold medals, set new county records and featured in local newspapers. Despite poor academic grades, his prowess in the pool won him a scholarship to Arizona State University. He did not go. Instead of going to college, Craig Venter moved out of the family home and headed to southern California. Once there, he spent as much time surfing and partying as he could, working a succession of evening or night jobs to pay the rent. Life was good. In 1965, however, the good times came to a shattering end. Venter found himself in a Navy boot camp in San Diego. With ever more military personnel needed for the war in Vietnam, he was going to be drafted into the army. Taking the advice of his ex-Marine father, he joined the Navy instead. The Navy measured Venter’s IQ at 142, opening a wide range of Naval career options. He opted for hospital corps school, not realizing that medics were high priority enemy targets. After completing his training, Venter served in 1967-68 as a medic at the DaNang Naval Hospital in Vietnam. Often his shifts were a living nightmare of hearing soldiers screaming in pain, treating brain-damaged teenage soldiers, and witnessing amputations, bodies torn to pieces, and a relentless cycle of death. He witnessed hundreds of deaths, with many of his patients dying while he was trying to save them. In a situation where medics were always in short supply, he needed to decide which patients should be given pain relief and allowed to die and which should get treatment and be given at least a chance to live. One day, after 5 months at DaNang, it got too much for the 21-year-old medic; he went to the beach and entered the water. He intended to keep swimming outward into the South China Sea until it consumed him. A mile out, he encountered a shark and got frightened. He decided he wanted to live, and he turned back, eventually landing safely. In August 1968, he returned to America a changed man. After experiencing so much despair and futility, he wanted to do something purposeful with his life. He decided to become a doctor. Venter’s school grades were not good enough to get into a leading university, which was the route to medical school. Instead, he began at the College of San Mateo, a community college. He hoped to transfer to a university for his third and fourth years. San Mateo was only a few miles from his parents’ home in Millbrae. Using his Navy medical experience, he easily found work as head of a hospital’s cardiac arrest team. In contrast to his high school days, Venter was now a committed straight-A student, who was overjoyed when the University of California, San Diego (UCSD) accepted him as an advanced student. At UCSD, Nathan O. Kaplan, an eminent biochemist heard about Venter’s previous adventures. He was intrigued enough to ask the recently arrived undergraduate to propose a research project. Venter’s idea – to study fight, flight, and adrenaline – was a turning point in his life, carrying him away from his plan to practice medicine and towards scientific research. Reading the scientific literature about adrenaline he learned that, although there were two competing theories, nobody knew why adrenaline made cells beat faster. Venter told Kaplan he had devised an experiment to finally resolve the issue. Kaplan enthusiastically gave Venter the go ahead to work in his laboratory with the result that just three years after leaving Vietnam, still an undergraduate, Venter published his first scientific research paper. He graduated with a bachelor’s degree in biochemistry in 1972, age 25, followed by a doctorate in physiology and pharmacology in 1975, both from UCSD. In July 1976, Venter joined the School of Medicine at the University of Buffalo, where he immediately formed his own research team, skipping the postdoctoral research worker phase most scientists pass through. At Buffalo he continued his work on adrenaline receptors, gradually shifting his focus from the heart to the brain’s neurotransmitter receptors for adrenaline. In 1983, age 37, a too-good-to-refuse offer came to Venter, to join the National Institutes of Health (NIH) in Bethesda, Maryland; with funding of over a million dollars a year, he took most of his Buffalo team with him. 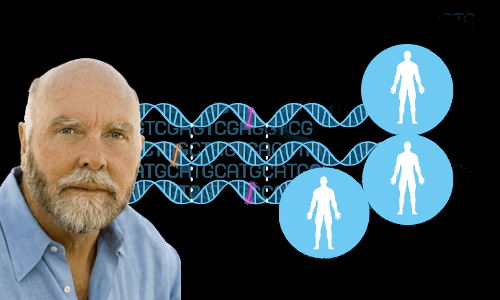 Venter began to consider the role our genetic code – DNA – plays in the brain’s adrenaline receptors. He and his team identified the entire gene sequence corresponding to the adrenaline receptor. This was a big achievement and a career changing moment. Sequencing DNA now became his priority. When scientists talk about sequencing DNA, they mean reading a sequence of letters. Part of a DNA molecule. The double helix supports the chemical groups known as bases. Using different arrangements of the A,C,G,T four-letter alphabet, Nature writes the sentences and paragraphs that facilitate the assembly of lifeless atoms and molecules into living organisms. The code also tells every part of the organism how to function. A single molecule of human DNA has about 3 billion pairs of these letters. The letters A,C,G,T represent the names of the four chemical bases attached to the double helix: adenine, cytosine, guanine, and thymine. Within the nucleus of a human cell, a DNA molecule coils into a space less than 10 microns across (that’s 0.001 cm). Uncoiled, and stretched out completely, a human DNA molecule is an amazing meter or so in length. At first, Venter was interested in reading the sequence of letters in only a small part of the human DNA molecule, the gene associated with the brain’s adrenaline neurotransmitter receptors. After a great deal of work, he and his team succeeded. Venter then turned his attention to discovering the complete sequence of letters in the human genome – in other words, discovering the coding of all the genes in a molecule of human DNA. This was a task worthy of Hercules. Sensibly, he concentrated on devising strategies that could accelerate and simplify the discovery process. Double Nobel Prize winner Frederick Sanger had developed the shotgun method of sequencing. This involved shattering DNA molecules into smaller fragments, using sound waves, for example. The fragments were small enough to permit the ATCG base sequences in each separate fragment to be read. Finally, advanced computing methods made it possible to reassemble the letter sequences from the fragments to reveal the complete sequence. While this technique was useful for sequencing the DNA of simpler organisms, such as bacteria, the human genome was too complicated to approach in this way alone. Much of the human genome’s complexity problem lay in the sheer quantity of useless ATCG base sequences in human DNA. For example, the section of the DNA molecule that determines your eye color – in other words the gene for eye color – has many base sequences that do precisely nothing. This is called junk DNA. These extra sequences dramatically increase the time and computer processing power needed to reassemble shotgun data. Just like a jigsaw, the more pieces there are, the longer it takes to assemble. Unlike a jigsaw, however, many of the DNA fragments add nothing useful to the overall picture. Fortunately, our bodies are able to tell the difference between the useful and the useless base sequences using messenger RNA – we would be dead otherwise. Venter realized he could make good use of messenger RNA. 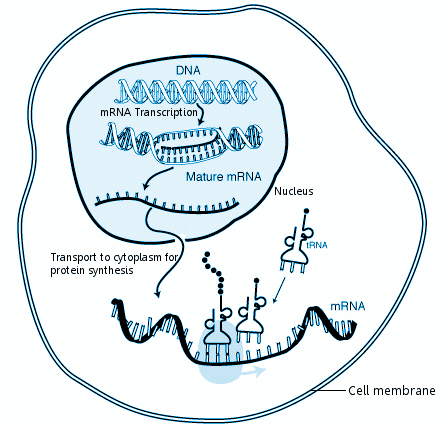 Messenger RNA (often written mRNA) is used to assemble proteins. It carries the instructions coded in genes in the DNA molecule to the cell’s protein factory. Messenger RNA is actually a copy of the ACGT base sequences in a gene. It contains only the sequences needed to assemble proteins and none of the confusing junk sequences. Venter used known techniques to convert the sequences in single-stranded messenger RNA back into double-stranded DNA. DNA made this way is called complimentary or cDNA. Reading the ATCG sequences in cDNA was a very, very slow task. But things looked up in 1987, when Caltech’s Leroy Hood found a way of attaching different colored fluorescent dyes specifically to the A, C, G, or T base letters in DNA. He then used laser technology to read the sequence of letters. Venter took Hood’s idea and had equipment built to automate the process of reading the letters, allowing computers to read the sequences. Venter’s next idea – the big idea – came to him on a flight back to America from a lecture tour of Japan. He knew he could make cDNA clones of small sections of DNA from different parts of the body. For example, a cDNA clone of messenger RNA found in the brain must contain a gene for some part of the brain’s function. He knew he could easily shotgun sequence such a cDNA clone to read its entire ATCG sequence quickly using his new automated sequencing technology. 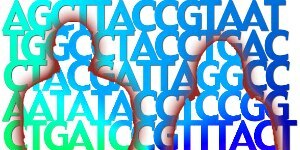 Putting it all together, he realized he had the means of reading the sequences in genes at unprecedented speeds and quickly building a library of human genes. He called his new method EST, an acronym for Expressed Sequence Tags – another name for cDNA clones. With EST he could get results in weeks that would take other researchers many years to generate. By the end of 1992, Venter’s team at NIH had identified over 7,000 genes. The combined efforts of all the other researchers on the planet had identified about 2,000. But Venter grew frustrated with NIH’s internal political battles. In 1992, he resigned and took up a new position as head of the not-for-profit TIGR, The Institute of Genomic Research in Gaithersburg, Maryland. TIGR was funded by Wallace Steinberg, a major-league venture capitalist. Steinberg wanted to keep American biotechnology ahead of other countries, and he also wanted to live forever: he saw decoding the human genome as a way of achieving both these goals. The funding deal meant Venter would publish a gene’s sequence only after another of Steinberg’s companies had studied its usefulness in medical treatments for 6 months, or 12 months in the case of genes that looked promising enough to commercialize. Steinberg would get a further 18 months before Venter published if the gene looked like it could be overwhelmingly profitable. Ironically, only three years after funding the project he hoped would find the key to eternal life, Steinberg died in 1995, age 61. Venter now began an ambitious plan to build a gene library. He took tissues from human organs such as the brain, heart and liver, then used his EST method to discover the genes responsible for building and operating these organs. Soon he was dealing with a flood of data. He began thinking about the possibility of assembling his gene library into the complete human genome. He asked computer scientist Granger Sutton to start developing software that offered the hope of building the fragments in his gene library into a complete genome. In 1998, Venter teamed up with Mike Hunkapiller of Perkin Elmer, who had designed and built the fastest sequencer yet available. Venter and Perkin Elmer formed Celera Genomics. Celera entered a race to sequence the human genome using Venter’s EST method in combination with 300 of Perkin Elmer’s sequencers. Their only competitor was the Human Genome Project (HGP), which had taxpayer funding of $3 billion and was expecting to complete its work in 2005. Celera’s funding was only about 10 percent of that, and they aimed to complete the project by 2000. On June 26, 2000 Celera and their HGP competitors made a joint announcement from the White House. They had sequenced the human genome in the form of a ‘rough draft.’ Celera and the HGP published details in February 2001 and the final sequence mapping was completed in April 2003. Venter’s February 2001 paper in Science: The Sequence of the Human Genome, had 274 authors. This was biology on a scale that could hardly have been imagined by Gregor Mendel, whose solitary work with peas provided us with the basic rules of heredity; or by Charles Darwin, squirreled away in his country home writing the Origin of Species; or even the scientists working in the 1950s to discover the structure of DNA – the three relevant papers had seven authors; Watson & Crick; Wilkins, Stokes & Wilson; and Franklin & Gosling. 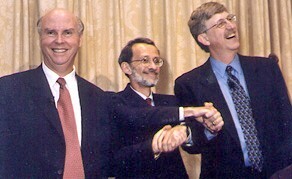 At the White House in June 2000 following the genome announcement: Craig Venter is on the left and Francis Collins, who headed the HGP, is on the right. Relations between the two men were often strained. In 2007, a team at the J. Craig Venter Institute led by Samuel Levy sequenced Venter’s genome. Venter shared information about his genome in his autobiography A Life Decoded: My Genome: My Life. For example, his ability to swim long distances is determined by the lack of a mutation that causes production of fatigue-causing enzyme. In August 1996, Venter’s team sequenced the genome of Methanococcus jannaschii, making a singular discovery. Over half the genes in this single-celled organism were previously unknown to science. Methanococcus thrives at thermal vents deep in the ocean. It is an example of the Archaea – a domain of life first recognized in 1977 by Carl Woese, adding to the two previously identified domains of Eukaryota and Bacteria. Almost all of our planet’s organisms are microbes. Even in the human body about ninety percent of the cells – trillions of them – are microbes. Less than two percent of the world’s microbes can actually be grown for study in the laboratory. The rest are rather mysterious. In 2010, Venter and his team synthesized a DNA molecule they had designed on a computer. The sequence of bases in the DNA was entirely chosen by Venter and his team. They introduced this DNA into a bacterial cell and allowed it to reproduce. Synthetic DNA offers the possibility of creating new species of bacteria that work as micro-machines carrying out operations such as converting sunlight to electricity; or sunlight, water, and carbon dioxide to oil. With a reputation as an outspoken, blunt, abrasive character, Venter has made enemies as well as friends in both business and science. His enemies call him ‘Darth Venter’ and reproach him as a publicity seeker. However, they cannot deny that his driven personality has allowed him to notch up a string of dramatic scientific successes. When he agreed to launch not-for-profit TIGR, Venter was awarded stock in its commercial twin. He later sold the stock for several million dollars and became a wealthy man. He could afford to indulge a passion for sailing he picked up in the Navy. He took sailing seriously, winning a trans-Atlantic race in 1997. The fieldwork for the Sorcerer II Global Ocean Sampling Expedition was carried out from the deck of Venter’s own 95 foot boat, Sorcerer II. Venter is an atheist. His father was a excommunicated Mormon. In 1968, he married Barbara Rae, a New Zealander. They had one son, Christopher, born in 1977. In 1980, Barbara left Venter. In 1981, after an affair that set Buffalo faculty tongues wagging, Venter married Claire Fraser, one of his postgraduate students. They remained married for 24 years. Claire was a senior scientist in many of Venter’s subsequent projects. In 2008, Venter married his publicist Heather Kowalski. "Craig Venter." Famous Scientists. famousscientists.org. 11 Jun. 2017. Web. Image of Craig Venter by PLOS journals and Liza Gross under the Creative Commons Attribution 2.5 Generic license.